This medium-sized "Crow" is moderately rare in Singapore, and is usually observed feeding at flowers or puddling on sandy footpaths and streambanks. The species is widely distributed, and can be found in urban gardens as well as in the nature reserves. It is also a resident species in back-mangrove habitats where its host plant, Gymnanthera oblonga (Apocynaceae) can be found. 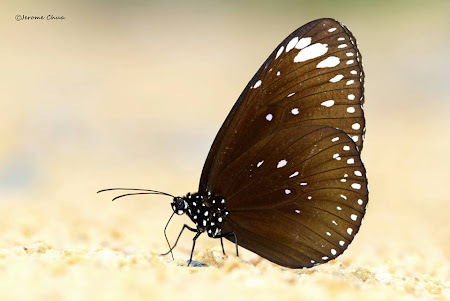 The butterfly has a slow and unhurried flight but can be skittish when approached. When it is feeding at flowers or puddling, it is distracted and can be photographed much easier. This shot of the Spotted Black Crow was taken by young ButterflyCircle member, Jerome Chua, a secondary school student in Singapore.